Maria Usbeck was nervous when she was asked by Yumi Zouma to open for them on a few upcoming US tour dates back in May. She had had never performed her solo material live, much less by herself. So she did the only thing she could think of in order to calm her nerves; she took a hammock with her. That sense of comfort seems to be at the core of what Usbeck is creating these days. 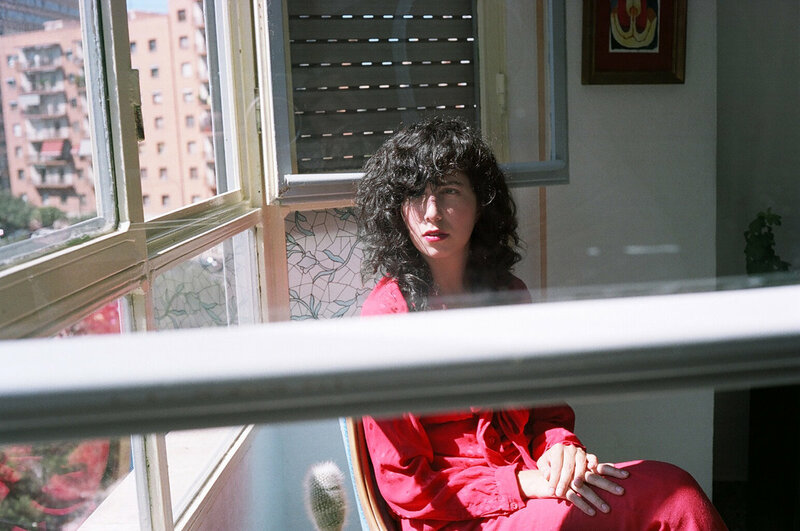 The Ecuadorian born artist released her debut solo album Amparo last month on Cascine and Labrador. It happens to be one of the warmest records of the year, both in terms of production and the sensation it leaves the listener with. The album is a collection of “organic dream pop”; waves of synth mixed with harps, xylophones, and various sounds from Latin and South America. Usbeck sits at the center of every song, her calm, airy voice pulling everything together. There’s a temptation (and disservice) to give the album a catch-all description of ‘tropical’, but the album has truly captured the way nature plays a factor in every song, bestowing on each a gorgeous and embracing atmosphere. It took her a while to get to this point though. Her solo album is rooted where so many other solo albums have come from; the end of a band. She had been the singer of the new wave band Selebrities before they had dissolved in 2013 after “basically a few months of touring, losing money, and no longer having fun, along with my guitarist leaving the band.” Usbeck decided to end the group rather than continue on. According to her, though, she wasn’t even thinking about making more music at the time. She began making audio and visual recordings on her phone of everything she was hearing, in every new place she visited. She then began folding various instruments (a bit of synth here, a drum beat there), slowly shaping the songs over a long period of time. She then took everything to co-producer Caroline Polachek of Chairlift, and the duo spent two months completing the album. Usbeck, during all of this, also decided to sing the whole album in her native Spanish. Right now that reaction appears to be pretty positive. Beyond kind words in the press, Usbeck has had people email her telling her not only how much they like the album, but for lyrical translations to help understand it better. Yumi Zouma fans from the show she was so nervous to perform at come up to her afterwards, telling her how much they enjoyed her music despite not being able to understand it completely. “People came after to the merch table, and they were like ‘I can feel what you’re saying. I don’t know what you’re saying, but I can feel it.’”, Usbeck recalls, a little fondness creeping into her voice. With her album finally out and her tour dates finished, Usbeck is already outlining new songs. Though she is leaving her options open, at least linguistically. When asked if she’ll do another Spanish album, she responds coyly. “I don’t know we’ll see,” Usbeck says. “I might wind up doing an album in Spanglish!” She laughs at the idea, though is completely sincere in the possibilities of it, going on to talk about the ways that lexicon has infiltrated her speech. It’s clear that Usbeck would make up a language if she thought it would express what she wanted it to. Not that it would be a problem; she’d still be able to make people understand what she was saying.